My POW (Project Of the Week) was to decorate for fall. I started yesterday and pretty much finished up today. I still have some things left in my fall decorating box which I may add in the coming days and I do want to get some more pumpkins and some gourds. But for the most part it’s done. Come with me as I take you on a little tour. I put some Autumn potpourri in the little brass container but since I’ve had it a very long time it didn’t have much scent. I sprinkled several drops of clove essential oil over it to refresh the scent. And speaking of scent, before I started working today I cut up a couple of dried up oranges, put them in a pot of water, and added cinnamon and cloves. I then let it simmer all afternoon giving the house a nice, Autumn scent. The flowers in the vase (which is actually a pretty cobalt blue which doesn’t show up in this photo) are from our yard. I also had some blooming goldenrod in there yesterday but we now know what plant David is allergic to. Oops. 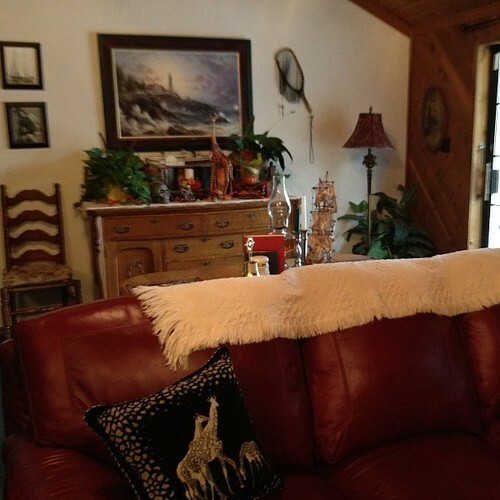 I added a cream colored throw to the back of the sofa. And aren’t my giraffe pillows adorable? I am ridiculously happy with them. Oh, and I have decided what color drapes I’m going to use in this room. I got some excellent advice from a guy in a bar the other night. Ha! I’ll tell you more about that later, after I order the drapes. The most time-consuming thing I did today was to thoroughly dust the edges of the stairs. As you can see in this next photo, I display books and my lighthouse collection on the risers. Most of the time I just take a feather duster to them but a few times a year I remove everything and dust very carefully. That’s what I did today. 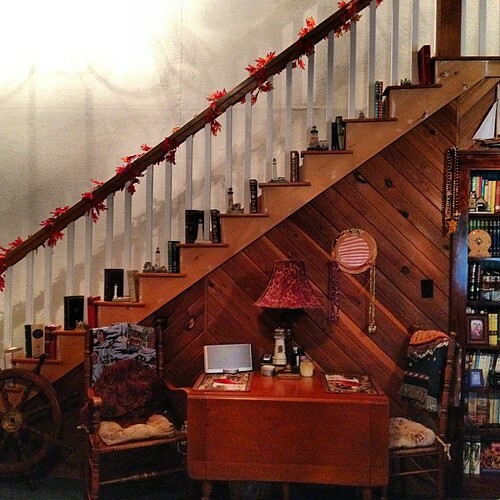 I then wrapped the bannister in a fall garland. As you may notice, we never have finished the skirtboard on the staircase. This is because we haven’t been able to decide what color to paint it. I think we have a plan, though. Maybe. And that huge, blank white wall? Still thinking about that. We’ve only lived here going on 16 years. Wouldn’t want to rush things. Oh, and do you see that ship wheel in the lower left corner of the picture? We won that in an auction in New Orleans and it’s going to be mounted on the fireplace. Someday. 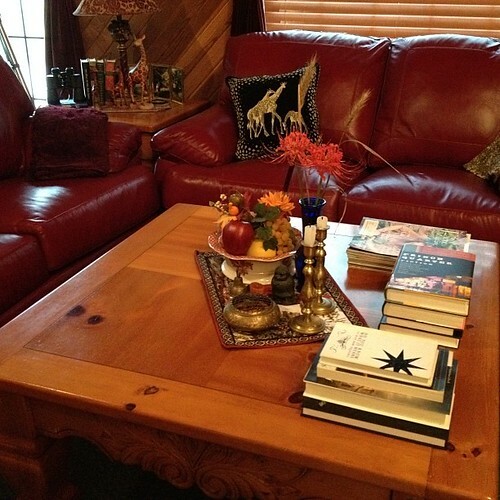 David bought this antique oak table in this next photo for my 16th birthday. Here it is dressed for fall. You can’t see it very well in this photo but there are three stacks of books along the edge which backs up to the sofa. These are the books I bought at the library book sale (minus the cookbooks which are in the kitchen). It may sound a little silly but whenever I bring home new books I like to keep them out for awhile rather than putting them on bookshelves. It’s my way of welcoming them into our home. Okay, that does sound a little crazy unless you also think of books as friends. In the background of the photo you can see a glimpse of the fireplace. 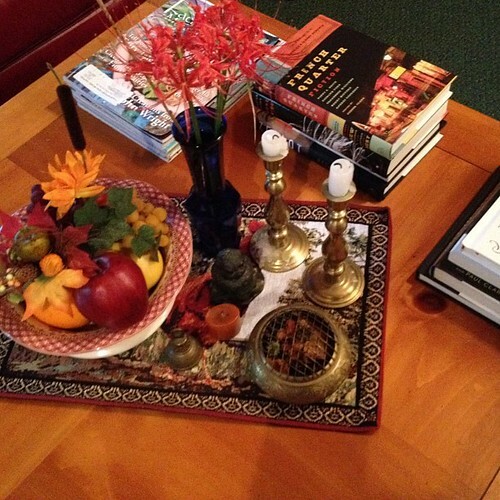 I forgot to take a picture specifically of it, but it’s decorated with fall foliage and a cornucopia. 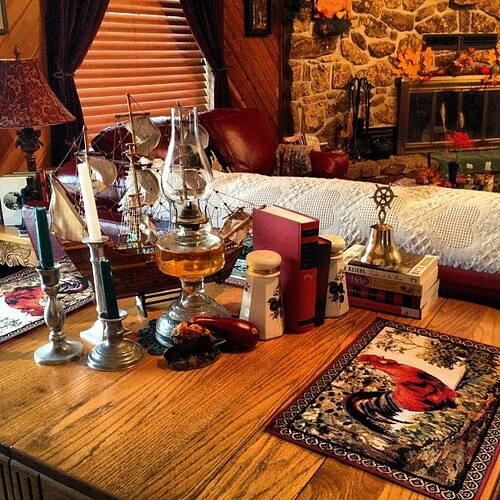 This is next photo shows one of my favorite areas to decorate seasonally. 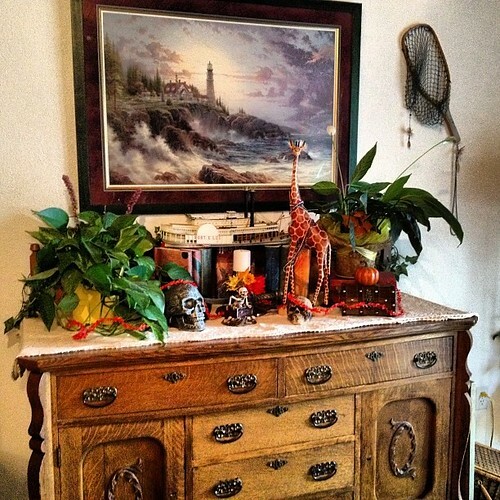 I covered the buffet with an antique lace tablecloth which had belonged to my grandmother. My Harry Potter book collection is on display (almost all are First Editions), plus one of my giraffes, as well as some skulls and a little pirate chest. The steamboat which is resting across the books was given to us by Kadi, our son’s girlfriend. She found it at a yard sale. It needs some small repairs and I want to set up a special display for it – perhaps on a display shelf along with one of the pictures I have taken of the steamboat in New Orleans. Be sure to note the TWO blooms on my peace plant. I’ve never had two at the same time before. Here is our entry table. 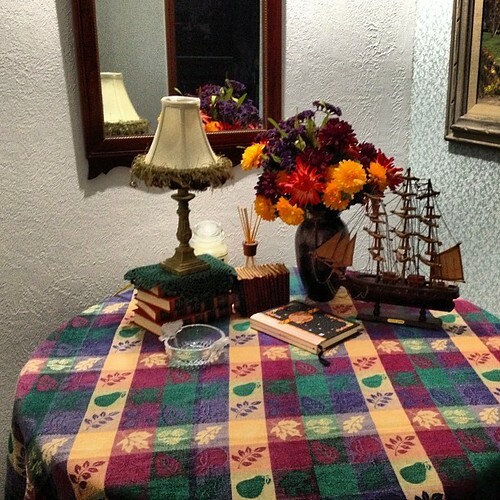 I put a fall tablecloth on it, as well as a vase of fall flowers. I need to buy some more candy for the little pumpkin-shaped crystal candy dish and I’ll probably also do a little display of mini pumpkins and gourds. 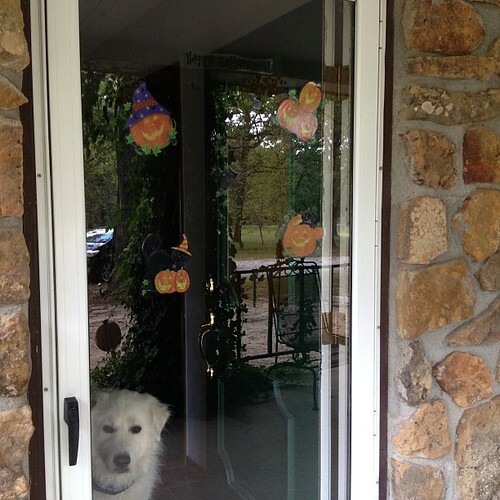 And finally, I put some Halloween clings on the front storm door. It’s really hard to get a picture of them because of the reflection but in addition the pumpkins you can see, there is also a little banner on top which says “Happy Halloween” and a few little bats scattered about. And of course, Shiloh photo-bombed the picture. Isn’t he cute? He needs a Halloween bandana. Thank you, Catherine. I enjoy "nesting".